General Selva, who was confirmed on August 2nd, will serve for the next two years as the second highest ranking military officer in the United States Armed Forces, tasked with developing and directing the military’s response to imminent threats. His remarks highlighted the various global threats currently facing the United States – including Russia, North Korea, and Iran. “The dams along the Nile River control the flow of water into what was the Fertile Crescent of Egypt,” he said, “and any change to that water flow causes the Egyptians to become more hostile to their neighbors who are putting dams upstream of the Egyptian stretch of the Nile River”—most dramatically, Ethiopia’s Grand Renaissance Dam, which will be the largest hydroelectric plant in Africa when completed later this year. While the nine nations that share the Nile River have so far managed it cooperatively (as is the case in most transboundary water basins), there is great concern about future negotiations in the tense region. The decimation of fish populations off the Horn of Africa has compromised the livelihoods of Somalian fishermen, arguably pushing some of them to piracy and insurgency. In the Sahel, “a small drought over a limited period of time can decimate the crops and cause instability and make that an area fertile for recruitment of extremists because they see no other way,” said Selva. The testimony from these current Defense Department leaders is backed up by a number of former and retired military leaders who also recently testified on Capitol Hill. “The mission of the Department of Defense is simple and straightforward – it is to provide the military forces needed to deter war and to protect the security of our country. Implicit in that mission is that our military needs to be prepared for every threat. Unfortunately, climate change is one of those,” said retired U.S. Marine Corps Brigadier General Stephen Cheney, chief executive of the American Security Project, on July 12, 2017, at a roundtable discussion hosted by the House Science Committee. Cheney was one of six panelists—including two retired rear admirals, David Titley and Ann C. Phillips, as well as former Deputy Undersecretary of Defense for Environmental Security Sherri Goodman—who agreed that climate change poses a real threat to the military’s readiness and operations, and thus to American national security. “The U.S. needs to improve its capacity to predict the likely locations of violent disruptions fueled in part by the consequences of climate change,” said Goodman, who is currently a senior fellow at the Wilson Center. She pointed to melting ice in the Arctic Ocean as a potential source of geopolitical jostling: “The region is more accessible to a wide variety of human activities including shipping, resource extraction, fisheries, tourism and other commerce. This activity level will accelerate in the coming decades. The increased activity brings high levels of risk to that fragile area.” These changes will require investment in marine infrastructure, improved telecommunications, stringent resource extraction standards, and protected land for Alaskan Natives, among many other safeguards. “The United States and the international community are not prepared for the pace of change in the Arctic,” she said. 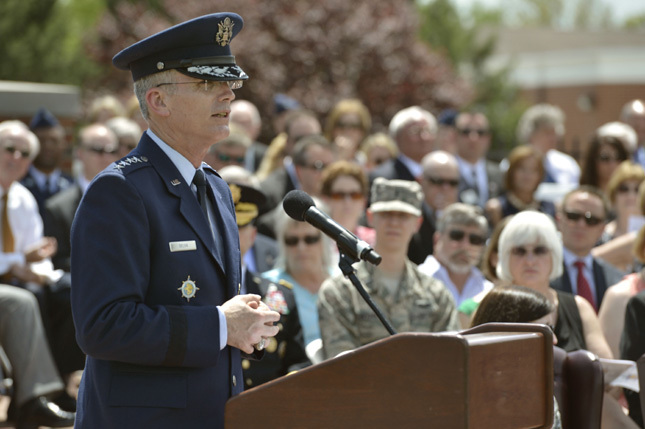 Listen to Gen. Selva’s remarks. Amanda King is a research intern with the Wilson Center. Great article. Really hit home how widespread this issue is from Ethiopia to the Arctic.